With the motto to “inspire adventure”, the Drfitsun was created in 2014 in the lakes of Northern California. The Drifsun was founded by the people who had a passion for sports and adventure. Driftsun promises to deliver the quality products to the customers at the best value. Driftsun deals in the ice chest, water games, and outdoor activities products. Where can you buy Driftsun Coolers? Drfitsun has not so much huge variety of products to offer but what they offer is something worth describing. So, if you are looking for cooler, You can choose from the Hard-Sided Coolers. Currently, Driftsun offers five hard sided coolers that come with different storage sizes. You can choose from Driftsun 20 quarts coolers, Driftsun 45 quarts coolers, Driftsun 70 quarts coolers, Driftsun 75 quarts coolers, Driftsun 110 quarts cooler. Besides the coolers, Driftsun deals in water sports and Recreational Products. The Driftsun coolers come in different sizes and storage capacity to meet the customer’s need. Different customers have different needs when it comes to storage sizes. Some people find it best to own personalized coolers while some people prefer the small-sized coolers. Moreover, the greater the size of Driftsun coolers, you can expect some additional features as you move on to the larger model. Rear wheel for easy transportation, built in bottle openers can be experienced in the larger model. Moreover, the larger models have greater ice retaining capacity. For more Series and Information click here. With the rivalry getting more and more intensified among the premium brands, now the brands come up some of the innovative features and technology. This is what we are expecting from Driftsun. Let’s find out what innovation do the Driftsun coolers bring to the table. Superb Build Quality – Let’s talk about the build quality. While looking for a cooler, we ensure that the cooler must be strong enough to handle breakage, collision, wear and tear. In this aspect, Driftsun has not made any compromise. Driftsun Ice chest come with the rotomolded technology that ensures it lasts longer. Great Insulation Life – Coming to insulation life, the Driftsun coolers come with the 3 inch insulated walls that keep your food and beverage cold under the tortured heat of the sun for more than 7 days. Besides this, the Driftsun Ice Chest comes with the Thermal Lock Freeze Style Gasket that prevents escaping of cold air in the outside atmosphere. Non-slip Feet – For the mobility, the Gorilla Grip non-slip feet does not let the sliding of cooler when you step out on your next adventure. Besides this, you can find molded tie-down slots that further get it easier to move or carry the cooler. No Sweet Exterior – Moreover, these coolers come with the “No Sweat Exterior” that prevents the conversion of gallous state of water into water droplets. Coming to the leakage thing, the coolers have drain plug system installed that prevents any sort of leakage. What’s more impressive is when you find out the built-in opener attached with the coolers. So, what you have to do is just Grab the beer, open it and start consuming. You don’t need to carry any additional bottle opener. Driftsun Hard Sided Coolers come in different storage sizes and thus, their dimensions also vary. Take a look at our comparison below that will brief you about these coolers. Our table has covered each and every Hard-Sided Cooler manufactured by Driftsun. Mobility – For the purpose of mobility, the cooler comes with the molded tie slots. Just tie the point with the tie slots and attach it to your boat. Moreover, you can find Gorilla Grip non-slip feet that will keep your cooler exactly where you had kept. Gorilla Grip non-slip feet prevent sliding. But the thing that seems a big deal to overlook is that you won’t enjoy the hard wheel features. Durability – When it comes to the durability, the Driftsun coolers brag about the rotomolded design. The rotomolded design makes it strong and durable. No matter whether you sit upon the cooler or just kick the side of the cooler, it will still stand strong. They can even suffer a collision. Visual Appearance – Driftsun coolers are not designed beautifully. Despite the different storage sizes, you have to content yourself with only the limited number of colors. You have the option to choose from the tan, seafoam, white, coral, grey. Moreover, you can not enjoy the customization as well. So, you can’t have your own design, pattern or color. Cost – The question that prevails in the mind of the buyers is if it is worth to buy the cooler? Is the price justified? Talking about the cost asked by the Driftsun for its cooler, we are so satisfied with the price tag. There are many other premium brands that offer the same specifications with the same specification but at a higher price. Ice Life – The Driftsun Coolers come with the rotomolded design and the thick insulated walls that give a better ice life. Addition of ThermalLock Freeze Gasket ensures that the cold air does not escape into the surrounding. As claimed by the company, the Driftsun coolers can give up to 10 days of ice life. Even the smaller cooler is capable enough to retain the ice for more than 5 days. But we find is a bit exaggerated. Depending on climatic conditions, you can get between 5-7 days of ice retention but ice retention for 10 days seems impossible. We would be really happy if it does not turn down your expectations. Running out of ice seems terrible when you are on an adventure. So, high ice life tops the list of priorities when looking for the coolers. Now, that we are all aware of the specifications of the Driftsun Coolers where we hardly talked about the ice life of Driftsun Coolers. Let’s see how it performs in terms of retaining ice. As claimed by the Driftsun, the coolers are capable enough to keep the ice for up to 10 days. Depending on the model you go for, you will find the ice life accordingly. For a great ice life, you must go the for the larger model. There might be variations in the ice life depending upon the factors where you would put the cooler. 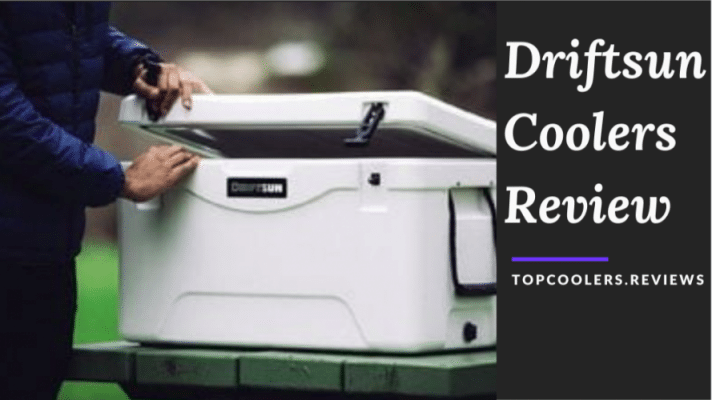 If you are impressed with the features of the Driftsun Coolers and are planning to buy the cooler, we advise you to visit the Amazon website. Amazon is offering Driftsun Coolers at the best possible price. Moreover, you can find all the different colors that excite you. Despite the colors, Amazon is dealing in all the sizes of the coolers that Driftsun manufactures and you might save your bucks. To visit Amazon website click on this button. You can also buy cooler from the Driftsun store as well. Just visit the website of Driftsun cooler, click on your desired product or model, add it to your card and make purchase. Everything is done in a jiffy. Driftsun coolers come as a big surprise to other competing brands. The premium features offered by the Driftsun is sure to create a great rivalry among the brands. But there is something we are not satisfied with. They need to bring more options in terms of coolers and accessories. Moreover, these coolers have a superior build quality and a great ice life. With the years, the Driftsun is trying to improvise themselves in terms of quality and quantity. Do let us know what are you planning to buy? We are looking forward to hearing from you. We hope your search for the best cooler ends here.